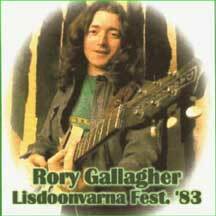 This month's "Boot of the Month" is Rory's performance at the 6th annual Lisdoonvarna Festival on July 31, 1983. Following a 2-night stand earlier in the week at the London Marquee (to mark the 25th anniversary of the club), Rory co-headlines along with Van Morrison at the Lisdoonvarna festival. Due to unfortunate circumstances this would be the last Lisdoonvarna Festival for 20 years until Peter Aiken's valiant attempt to revive the famous festival in 2003 albeit relocated to the Dublin RDS arena. 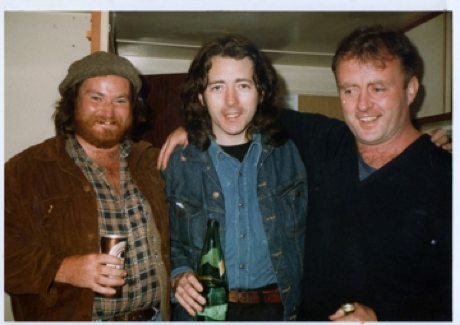 Rory's song, 'Brute Force and Ignorance', from the '83 Lisdoonvarna Festival is featured on a compilation album of the early years of the festival titled "Donal Lunny's Definitive Lisdoonvarna". Lisdoonvarna lies in the heart of the Burren region, in County Clare, Ireland, and a scant 3 miles from the famous Cliffs of Moher. Its name comes from the Irish "Lios Dhuin Bharna" meaning "enclosured fort in the gap," thought to refer to the green earthen fort of Lissateeaun, which lies 15 miles to the north-east of the town, near the remains of a Norman-era castle. The picturesque town became a popular health resort in the early 19th century after a famous Limerick surgeon, Dr. Sylvester O'Halloran, proudly expoused the curative effects of it's mineral waters. Lisdoonvarna's famous Victorian Spa Complex and Health Centre remains the only active spa centre in all of Ireland. Trading on the popularity of the spas, Lisdoonvarna plays host to several large festivals, the most popular of which is its Matchmaker Festival. Every September Lisdoonvarna plays host to one of Europe's largest matchmaking events, attracting upward of 40,000 romantic hopefuls to the quaint hamlet. Besides the Matchmaking Festival, Lisdoonvarna is also host to the Irish Horse Racing Festival, the Marching Bands Festival, and the Irish Barbecue Championships. 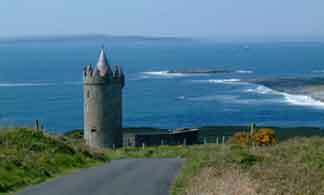 Between the years of 1978-1983 it also hosted the annual music festival, simply known as the Lisdoonvarna Festival. Organized by Jim Shannon and Paddy Doherty, The first Lisdoonvarna festival was held in 1978 and was a huge success. One Irish Newspaper would call it the "Irish Woodstock". The Lisdoonvarna Festival enjoyed a successful run of 6 years until 1983 when two unfortunate events overshadowed the excellant performances on the stage. Newspaper coverage of the festival was dominated by the tragic deaths of 8 youths attending the concert who drowned in the treacherous waters at Tr� Leathan, as well as the violence caused by a group of Hells Angels from the southeast of Ireland. In 2003 Peter Aiken Productions attempted to revive the most famous of Irish Music Festivals, but the town council vetoed the proposal, voicing concerns over the ability to safely stage such a large event and Mr. Aiken was forced to move the location to Dublin's RDS Arena. For now, the 1983 Festival seems to be the last of great Lisdoon Festivals, immortalized by Christy Moore's famous song, Lisdoonvarna. Love to hear about one of THE GREATEST moments in my Life. Never have I witnessed such comraderie amoung the people, AND the artists performing!!! ...and the Smithwick's wasn't bad either!!! Administrator comment: I'd love to include it on the Lisdoonvarna page if you ever scan or photograph it.